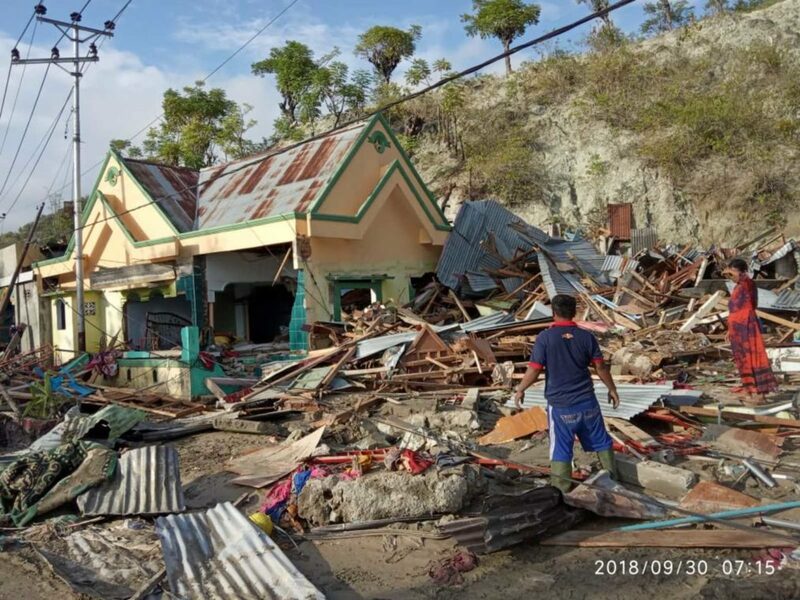 In Central Sulawesi, Indonesia, more than 2,000 people have died and a further 10,700 people have been seriously injured, following a recent series of earthquakes, including a 7.5 magnitude earthquake on Sept. 28 that triggered a tsunami and landslides, according to UNOCHA. More than 67,000 houses were severely damaged or destroyed, and an estimated 330,000 people now lack adequate shelter. As access to affected areas has improved, the humanitarian response is being scaled up to support government-led efforts on the ground. (We will update this report as additional information becomes available). The American Red Cross is part of the world’s largest humanitarian network with 13 million volunteers in 187 countries. Working together, it helps respond to disasters, build safer communities, and teach the rules of war. Each year, the American Red Cross reaches an average of more than 100 million people across the globe. More than 179 volunteers and staff from the Indonesian Red Cross are currently working with government agencies on the ground in Sulawesi, conducting search and rescue activities, providing medical support and distributing relief goods. The Red Cross has also sent 15 ambulances and 22 water trucks. Additional relief supplies and critical aid are on the way from five regional warehouses. Early assessments indicate that the most urgent needs will be medical care for survivors and provision of food, shelter, blankets and clean water. Residents also need communication tools to help account for their loved ones. The Red Cross is also helping to comfort traumatized survivors. Americares is actively coordinating with government officials and local aid organizations to meet the health and mental health needs of survivors. Thousands of injured or vulnerable residents have been medically evacuated from Palu and surrounding areas for medical treatment in other parts of Indonesia. Americares stocks emergency medicine and relief supplies in its warehouses in the U.S., Europe and India that can be delivered quickly in times of crisis. Founded in 1945 with the creation of the CARE Package®, CARE is a leading humanitarian organization fighting global poverty. Women and girls are at the heart of CARE’s community-based efforts to improve education and health, create economic opportunity, respond to emergencies and confront hunger. In 2017 CARE worked in 93 countries and reached 63 million people around the world. CARE is sending members of its emergency response team to the affected areas as part of an interagency assessment. CARE will focus on the specific impacts on women and girls who are often disproportionately affected in natural disasters of this type and are at increased risk of many types of sexual and gender-based violence. CARE will distribute kits targeted at women and girls that include sarongs and sanitary towels among other items. Emergency family shelter kits, including items such as such as tarpaulins, sleeping mats, blankets and solar light, also will be provided to those who have lost their homes. CRISTA is a family of ministries loving God by serving people worldwide in the areas of education, international relief & development, senior living and media. World Concern is a Christian global relief and development agency extending hope and opportunity to people facing extreme poverty. World Concern plans to provide survivors with emergency shelter, clean water, and medical supplies. Microsoft Philanthropies has provided $50,000 total in cash grants to NetHope, World Vision Indonesia, and the Red Cross. The MSN and Bing teams highlighted key nonprofit partners, including Mercy Corps, Doctors Without Borders, and the Red Cross. A staff giving portal, which offers a one-to-one match from Microsoft, has so far raised more than $80,000 for relief efforts. Mercy Corps is a leading global organization powered by the belief that a better world is possible. In disaster, in hardship, in more than 40 countries around the world, Mercy Corps partners to put bold solutions into action—helping people triumph over adversity and build stronger communities from within. Mercy Corps plans to provide essential supplies including water, food and hygiene kits. The organization has been working in Indonesia for twenty years and its national staff are experts in responding to natural disasters. Oxfam America is a global organization working to right the wrongs of poverty, hunger, and injustice. As one of 19 members of the international Oxfam confederation, Oxfram America works with people in more than 90 countries to create lasting solutions. Oxfam saves lives, develops long-term solutions to poverty, and campaigns for social change. Together with local partners, Oxfam is working to deliver water purification units and scaling up its response to reach 500,000 people with clean water, essential aid supplies, like hygiene kits, water kit and shelter packs and livelihood support. Oxfam believes in the importance of developing local humanitarian leadership before and after disasters and is partnering with a network of community-based organizations as the local force in disaster risk management and response in Indonesia. World Vision has set up an infant and child feeding center outside its office in Palu, the Central Sulawesi capital, and plans to scale up relief activities as soon as possible, staff say. The organization had pre-positioned relief supplies in Palu, including hygiene supplies and kits for families and children. Immediate needs are for food, shelter, nutrition, child protection, and water and sanitation.